Astrophotographer Giuseppe Petricca took this image about two minutes prior to the start of the full totality phase of the Supermoon total lunar eclipse on Sept. 27, 2015. A turquoise light tints the blood moon in this stunning skywatcher shot from Pisa, Italy. "There are obviously the reddish and brownish tones of colors, but near the lower border we can clearly see a bluish/turquoise tone," Petricca told Space.com in an email. 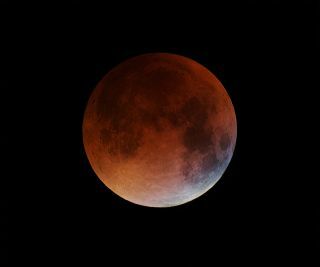 Normally, during an eclipse, sunlight that manages to reach the surface of the moon is scattered as it passes through Earth's atmosphere, resulting in the reddish colors seen on the lunar surface. The bluish tone comes from sunlight passing through the Earth's ozone layer. The image is an integration of 100 (on 200) shots with my Reflex Camera Canon 700D combined with a Samyang Catadrioptic 500mm f/6.3 Lens. Editor's note: If you have an amazing skywatching photo you'd like to share with us and our news partners for a possible story or image gallery, send images and comments in to managing editor Tariq Malik at spacephotos@space.com.